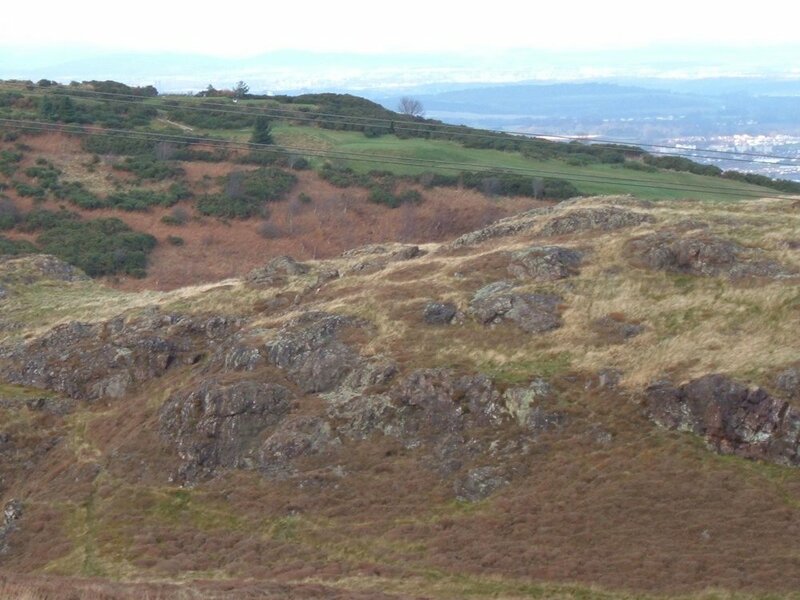 The excursion aims to examine some of the Lower Devonian basalts and trachytes of the Pentland Hills Volcanic Formation, and rare exposures of rocks of the Kinnesswood and Ballagan formations (Carboniferous). The geological foundations for the local reservoirs of Torduff and Clubbiedean will be discussed. The excursion aims to examine some of the Lower Devonian basalts and trachytes of the Pentland Hills Volcanic Formation. Rare exposures of rocks of the Kinnesswood and Ballagan formations (Carboniferous) may also be seen. The geological foundations for the local reservoirs of Torduff and Clubbiedean will be discussed. Meet at 7.00 pm at the roadside car park on south side of Bonaly Road bridge over the A720 Edinburgh Bypass [NT 213 679] (there is no exit/slip from Bypass onto Bonaly Road; the nearest is Redford slip). Return to Bonaly Road bridge by 9.00 pm. Roadside car park on south side of Bonaly Road bridge over the A720 Edinburgh Bypass [NT 213 679] (there is no exit/slip from Bypass onto Bonaly Road; the nearest is Redford slip). Circular route around Torduff Reservoir. The walk goes firstly to the west end of Torduff Reservoir [NT 206 677] and then to the dam of Clubbiedean Reservoir before returning via Torduff Hill and the track leading north past Bonaly Tower. Total distance of 5 km is mainly on good tracks; some heathery moorland. Wear walking boots. Walking poles may be of assistance. Walking on single track road with occasional traffic, and grassy or stoney public footpaths; some short moderately steep ascents and descents. Mykura, W. p. 169-173 in McAdam, A D and Clarkson, E N K.1986. Lothian Geology – an Excursion Guide (Edinburgh Geological Society). Sivasubrammaniam, A and Carter, V F. 1969. Investigation and treatment of leakage through Carboniferous rocks at Clubbiedean Dam, Midlothian Scottish Journal of Geology, Vol. 5, 208-223.